'Frosty Snowball' (Bernard Hamner, R. 1987). Seedling# 82-224. TB, 35-36" (89-91 cm), Early to midseason bloom. Standards snowy white; falls blue, white spot around lemon-tipped beard; ruffled. (('Princess Gloria' x 'President Farnsworth') x 'Shadow Magic') X ('Mystique' x 'Princess Gloria'). 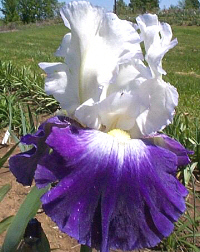 Hamner's Iris 1987. From AIS Bulletin #266 July 1987 Introducing FROSTY SNOWBALL-TB, 35-36", E-M. This outstanding iris has snowy white stands. The medium blue falls are wide and horizontal with a large white area around the lemon tipped beards. Beautiful candelabra branching with 7 buds. Lovely ruffled form. Sdlg. 82-224: ((Princess Gloria x President Farnsworth) x Shadow Magic) X (Mystique x Princess Gloria.) $35.00. Hamner's Iris Garden.